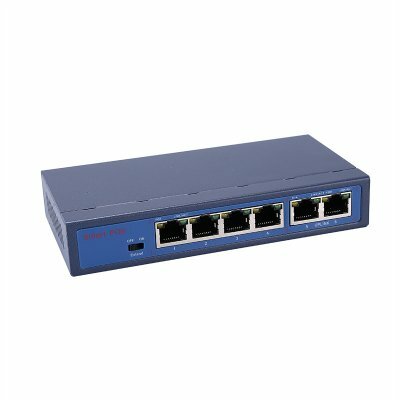 Successfully Added 6 Port PoE Switch - Supports 4 IP Cameras, 100Mbs, Short-Circuit Protection, 100m Transmitting Distance, Energy Efficient to your Shopping Cart. This 6 port PoE switch supports up to 4 IP cameras. From now on you’ll no longer have to be bothered by too many internet cables and a lack of ports on your WiFi transmitter. Simply connect the PoE box to your WiFi box, and you’ll be able to plug in up to 4 more PoE cables. This switch has a transmitting distance of 100 meters. Thanks to this, it can be perfectly used for in small offices and warehouses. With its four 100Mbs PoE ports, this electronic gadget is easily capable of handling the latest IP cameras. For those of you that own an NVR kit but are having trouble connecting each camera to the web – this PoE switch offers the ultimate solution. Each port has an output of 30W which is perfect for any type of camera. Featuring an energy efficient design, you’ll be able to use this gadget in a cost efficient manner. It comes with short-circuit protection thanks to which you’ll never have to worry about the well-being of your cameras. Simply plug them in, and they’ll all be treated with a stable power and internet supply. It supports IEEE 802.3af, IEEE 802.3at, IEEE 802.3u, 100BASE-TX IEEE 802.3x, and 802.3az standards. Thanks to this, it is certain to work with your network cables. This cool PoE switch allows you to greatly expand your network. It lets you expand your network to those remote areas your IP cameras are located that normally do not have access to a power output.